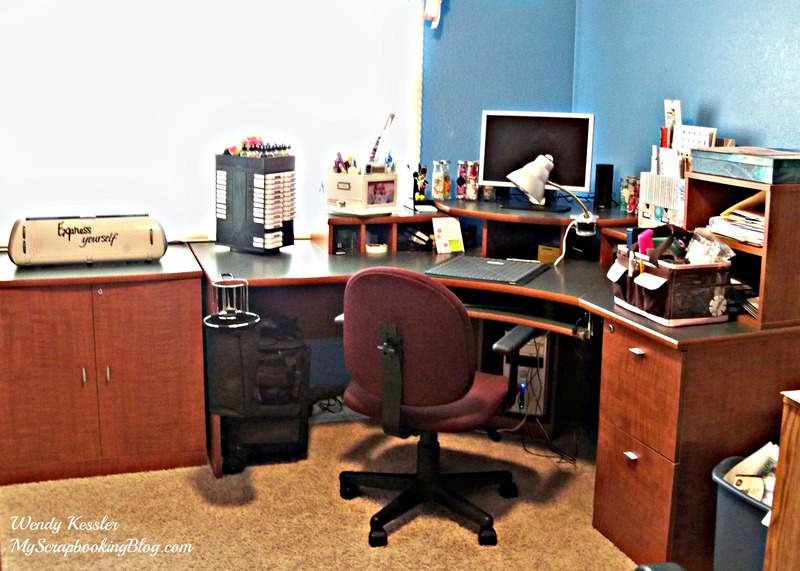 Go to this post if you’d like to see pictures of how my room was before. 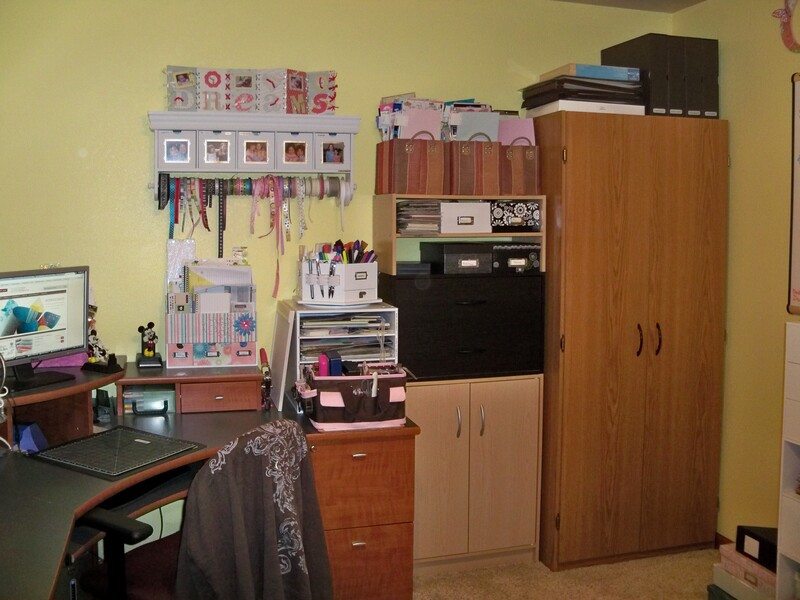 I haven’t had much to share lately and to make a long story short, it’s because I have moved my scrapbook room – quite the feat! Before I started, I thought I was moving to a larger room but in the end it seems smaller. Must be the shape, I actually haven’t figured this out yet. This wasn’t a completely bad situation. It made me go through my supplies and get rid of what is just taking up space. I have learned a lot in the past couple years as I have tried to buy less and work at using up my stash. As a consultant, I still make regular Close to My Heart purchases but I know that this is what I love and use the most. Much of the rest of my stash sits because I don’t make it much farther than what I have recently purchased. Okay, so I still need to work on this! My only regret with moving so far is that it was done in a rush and I was unable to paint the room before I moved into it. I will probably live in the blue with animals for a long time before I build up enough energy to move everything and paint a more enjoyable color. I do LOVE the window! My desk is about the same, other than I have cleared off more space and have bottles of flowers on my desk now (less shelf space now and I do use these a lot). 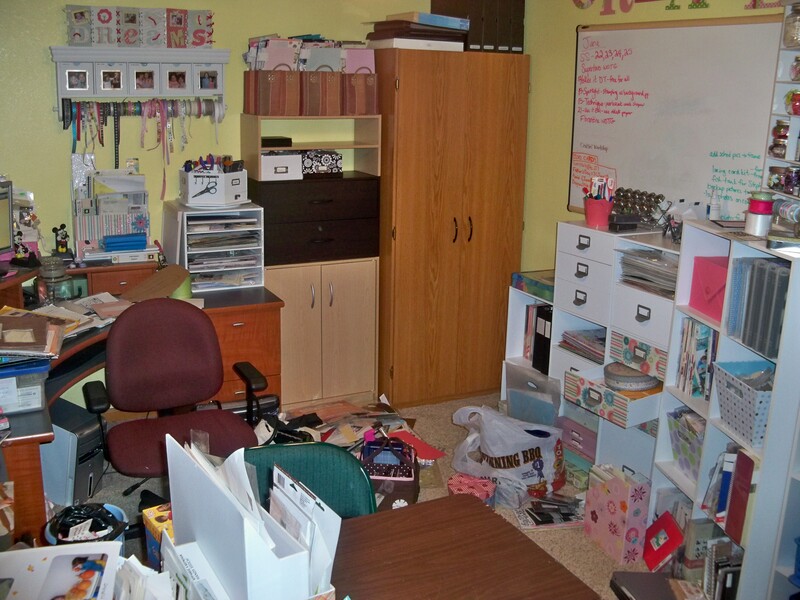 That basket on the right of my desk contains necessary, commonly used supplies (ATG gun, adhesive, photo cutter, markers, acrylic blocks/stamp cleaner). 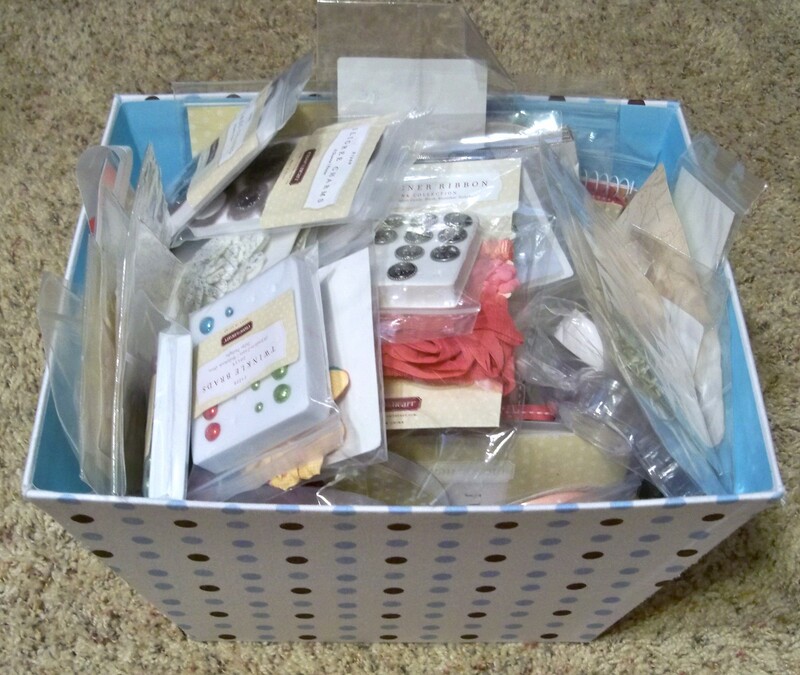 Since I am not able to always scrapbook in my room, this basket is easy to grab and go when I go to a friend’s or scrapbook downstairs. These are my favorite storage items along this wall. 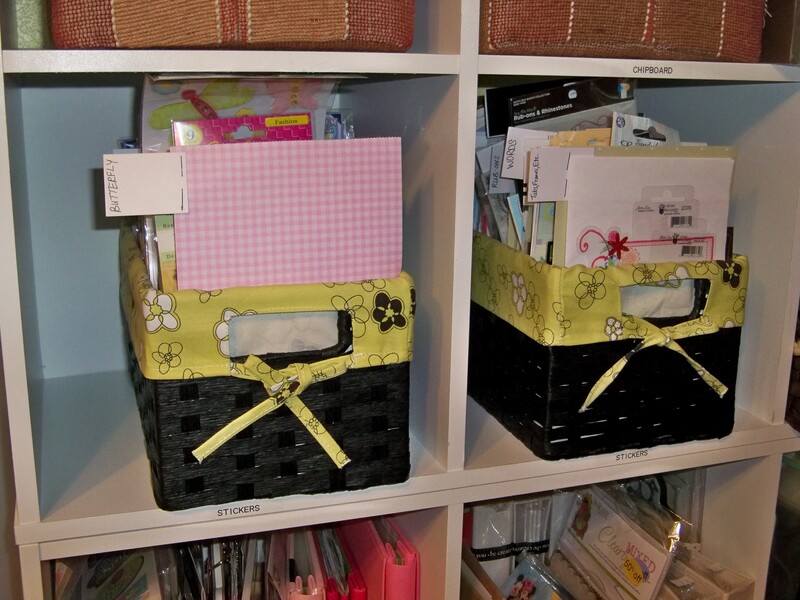 The stamp storage is no longer available but I like that it fits in a small area. The 12×12 cubes are from Michael’s and they are great. They tend to bow apart as you build them taller so I made the top and bottom open cubes and attached the sides instead of the top/bottom. This seems to hold them in place better. That tall cabinet I love to store all my paper. I cannot believe that it has survived moves and holds all of my heavy paper so well (purchase many years ago at Shopko). Here’s the inside of my closet as best I could get pictures. It is a large walk-in so it is shared right now with my daughter’s clothes. They may move out but I will need to use it for some other storage. I took out the curtain rods as was able to fit in perfectly these cube organizers from Target. I really like these too but they don’t hold 12×12. I have ribbon, metal embellishments, acrylic embellishments, and misc stickers/other embellishments stored in the baskets by theme. On the right I have misc. 3D projects in the top cube, then more baskets, and the one that looks messy has photos and to-finish projects or to-use-right-now items. 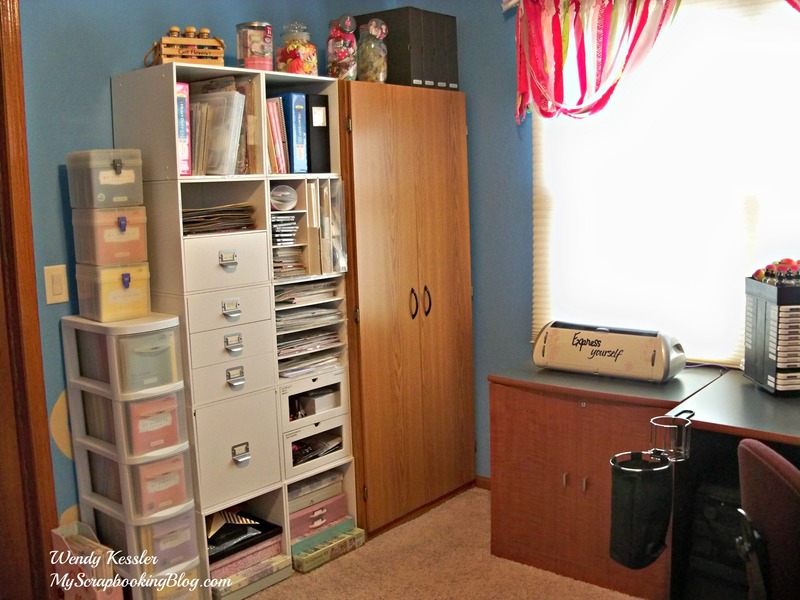 You can also see clipboards slid into any open spaces. I have run out of notebooks to alter so if I have a birthday coming up I will most likely whip up a clipboard (would be much easier to have done ahead of time!). Clipboards are great gifts for kids and I pick them up cheap at garage sales. It doesn’t matter if they are written on because I will cover it up anyway! The bottom part here holds baskets with words, alphabets, gems/rhinestones. Also idea books, card supplies, punches, and sewing. 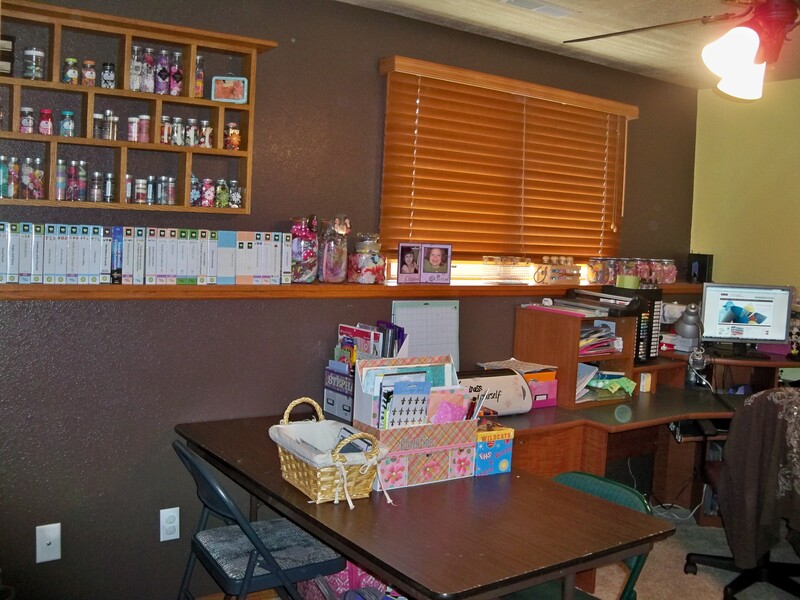 The cubes to the right have CTMH business supplies and a 12×12 drawer unit from Michael’s which holds embossing supplies, glitter, chalk, colored pencils, etc. Now, on to more specifics. Before, I had my supplies sorted in product categories (chipboard, metal, acrylic, stickers, etc.). This really isn’t how I scrap and I wasn’t using those supplies. I still have some of those and generals but anything that can be categorized by theme I have moved (birthday, Christmas, flowers, butterflies, words, letters, etc.) 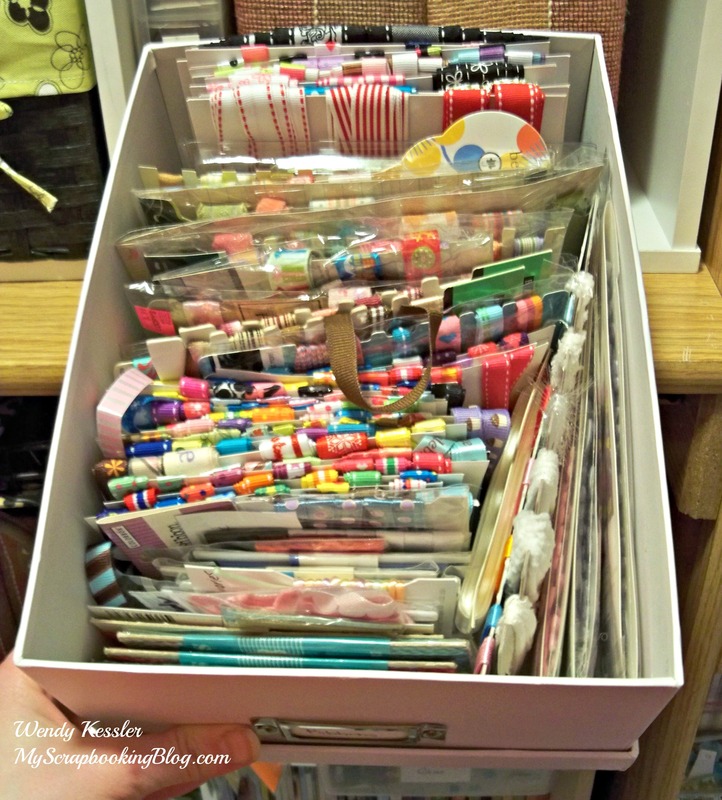 This IS how I scrapbook and how I search for supplies. 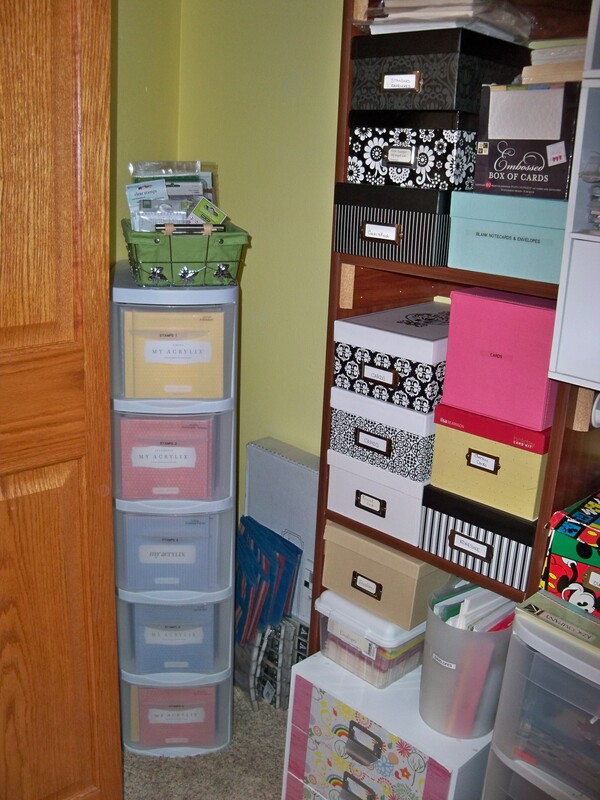 I am have already been using more of my older stash with this new organizing. I have gone through every single thing (with the exception of paper….still working on that) in my scrapbook room and have thought about if I will use it or not and if it is worth keeping. I have added MUCH of my stash to my rummage sale pile and I feel good about it. I’m sure I won’t miss any of it. Another realization is that I have A LOT of ribbon! Not sure why but I haven’t been using ribbon much lately so that’s something I need to work on. 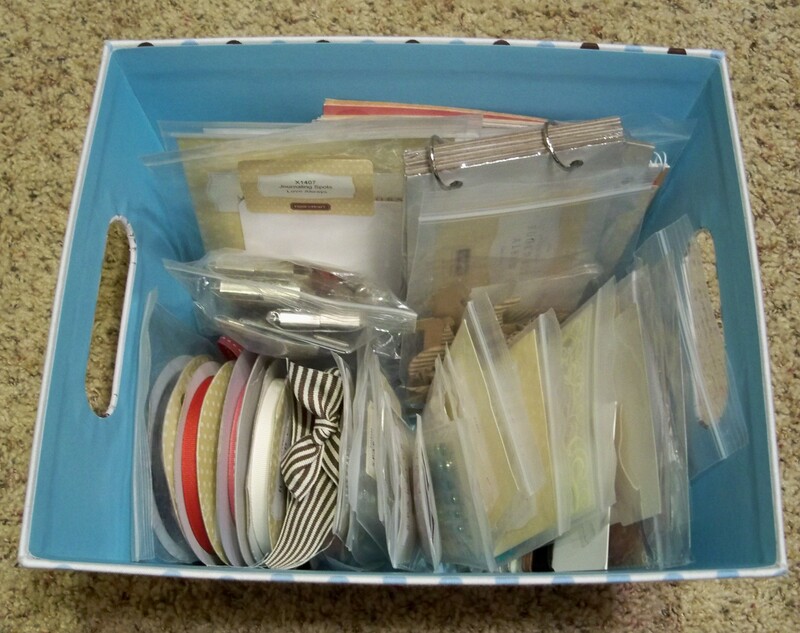 Part of the problem with my ribbon was that I had many different methods of storage and it was all over the place….ribbon spools, floss boxes, baskets, even a ribbon purse. 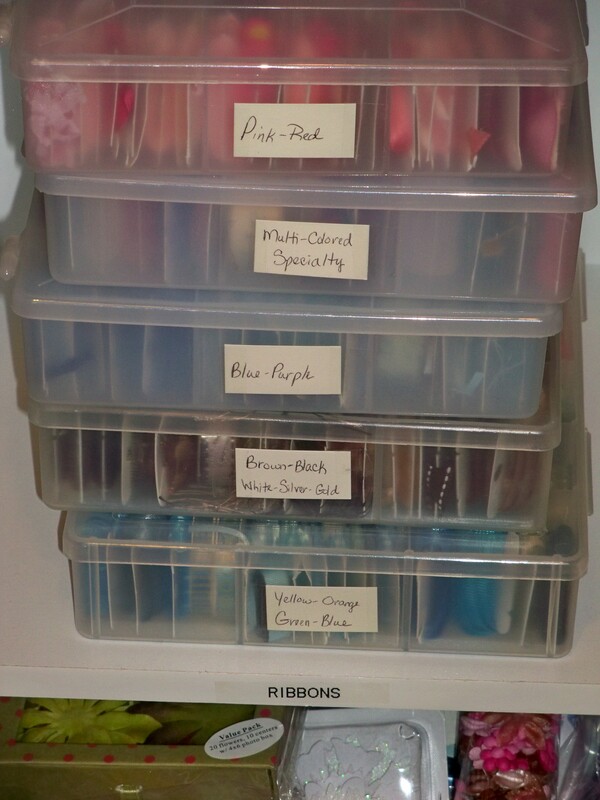 I left what was in the floss boxes because it is well organized and I like this method of storage. My Pebbles Inc Ribbon Iron comes in handy with this storage and I love this little tool! 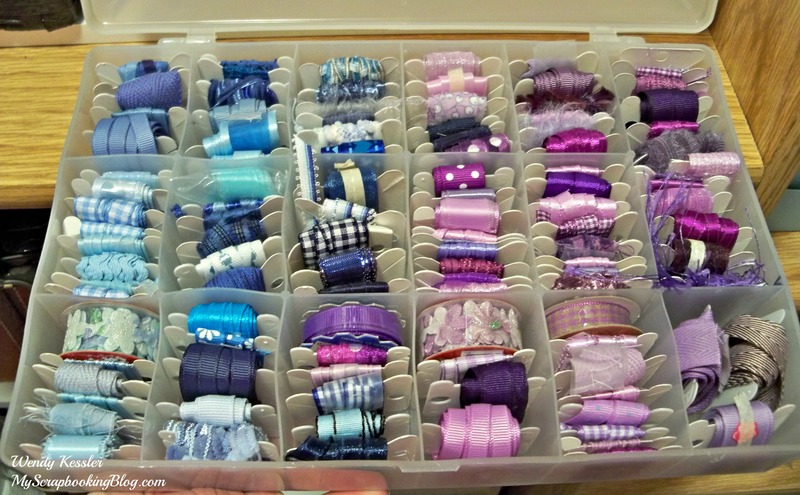 However, I had many more spools of ribbon that didn’t have a home and I didn’t want to invest in more supplies. Here is my solution and really the best storage method that I have personally found. 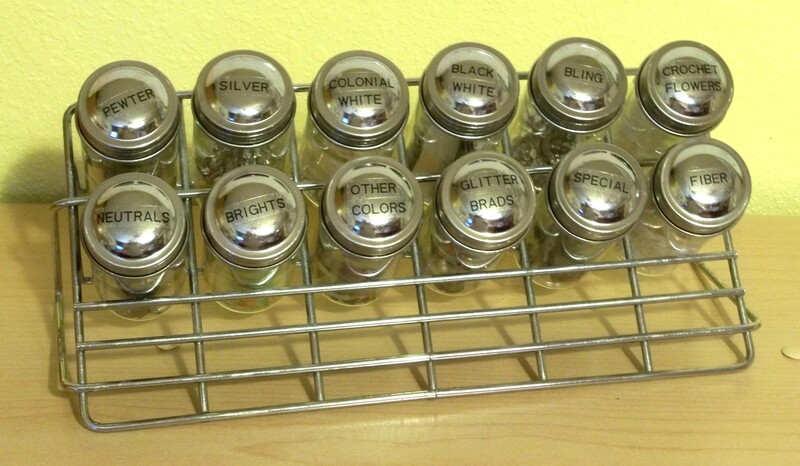 It is inexpensive and you can put them away but they are still easy to access and view. I taped and wrapped the ribbon on large recipe cards – ones that didn’t fit well in my recipe box (why do I even have these??) You could also use index cards, cardboard, or cardstock. Then I “file” the wrapped cards of ribbon in photo boxes. As I was putting them on the cards, I tried to sort by color or coordinating ribbons for easier matching later. So, there you have it. 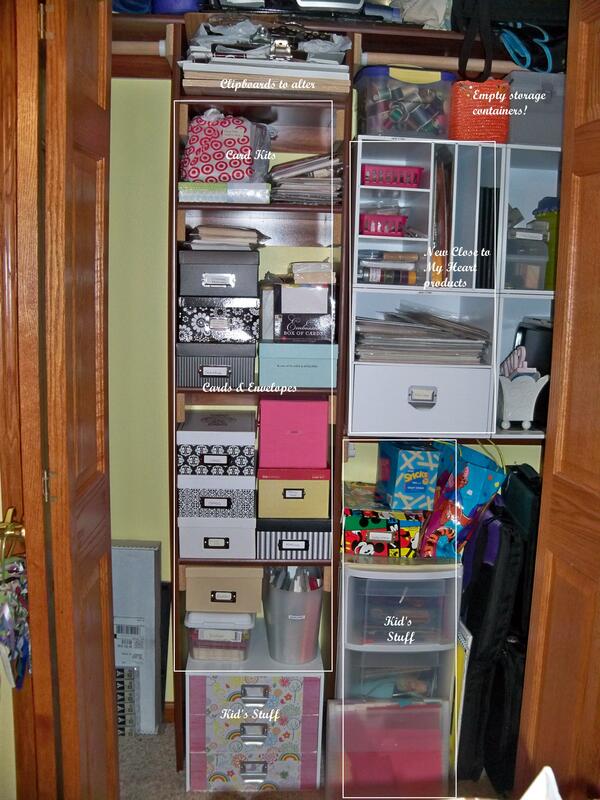 I hope you have enjoyed the tour of my cozy scrapbook space and how I’ve organized my supplies. And here are the after pics around the room starting at the door and moving around from left to right. I used most of the shelving that was in the closet but added the four white shelving pieces on the right (from Michael’s). 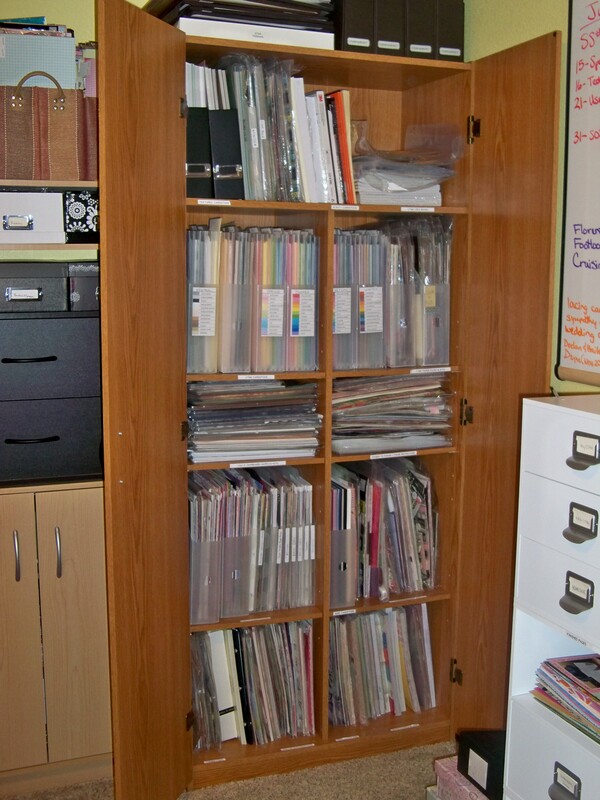 I stocked up on photo boxes because they are great to use as storage and used more of them that I thought I would. The ones you see here store my cards (finished and need to work on) and envelopes (all sorted by sizes). 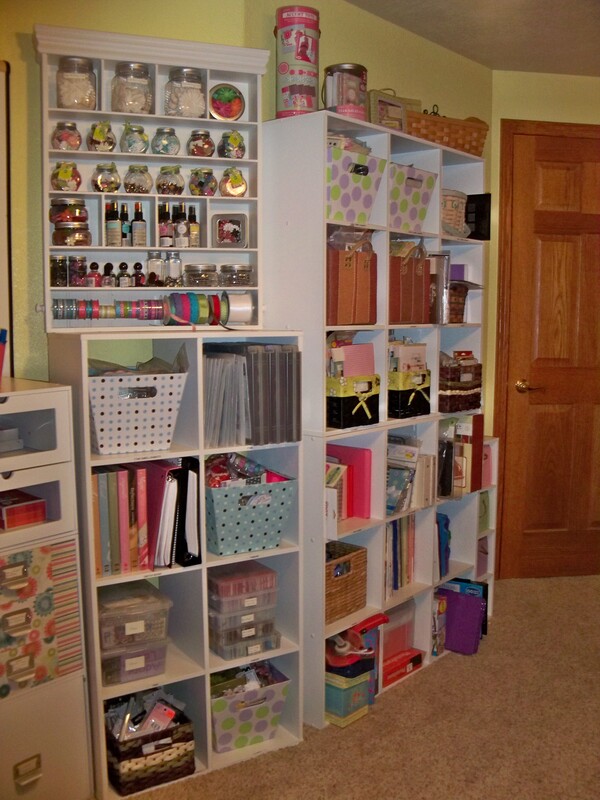 This area was organized before but looks SO MUCH NICER in boxes, it’s amazing! And things are easier access too. I also have a stash of new Close to My Heart products here. The bottom drawers are for my girls and their supplies. This is the inside corner of my closet. The wall is slanted so it makes a point to the corner. It’s not the best for storage but not space goes unused. My tower for my Close to My Heart stamps fits here at an angle and then I have a basket of other stamps that sets on top. The shelf on the wall I found on a rummage sale. It was one of those that you often see that had another piece on the top with cutout hearts. It took some muscle but I pulled that top piece off so I could use more of the top for a shelf and update the look. I didn’t even bother fixing the unfinished edge when I was done because it is along the top that you can’t see. 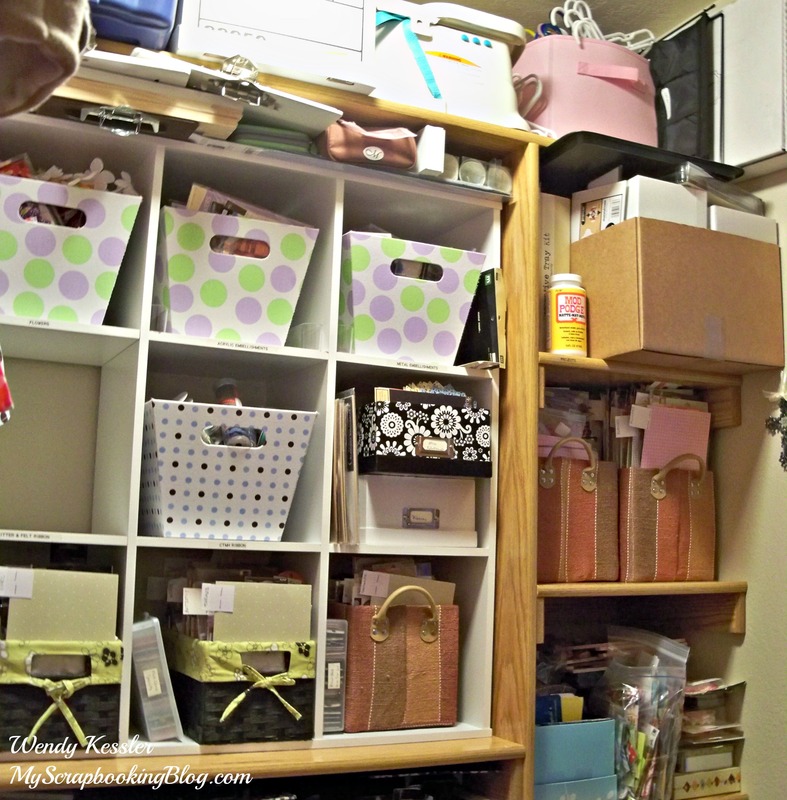 I love the shelf along the wall in this room and I use it to store my cricut cartridges and display artwork. 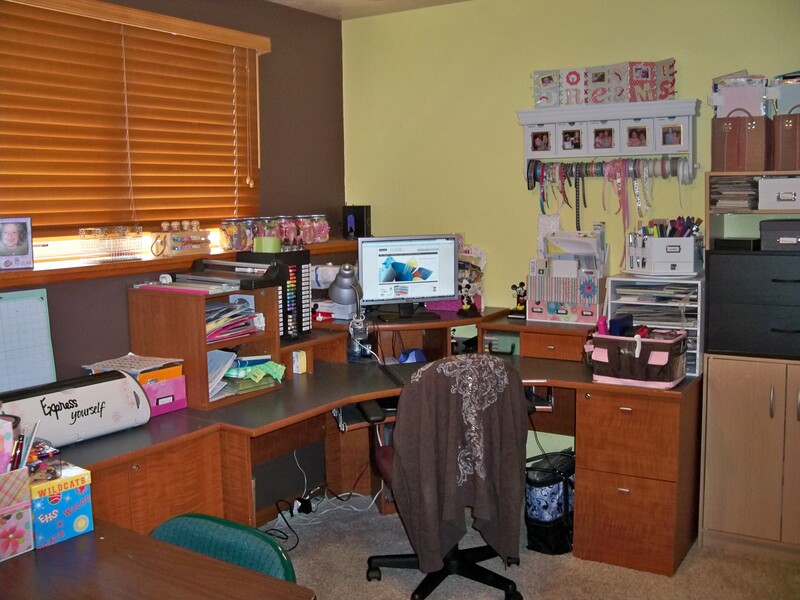 The table is for my girls to scrapbook/craft at. Believe it or not, this corner desk and side piece is another rummage find from way back. It was probably one of my best deals ever. The side piece fits 12×12 albums. I can’t remember anymore but it was something like $25-$50. The shelf piece on top I got for free at an auction house. I told the guy I wanted it instead of a new desk because it matched the one I had and he said to take it because he was just going to throw it away! 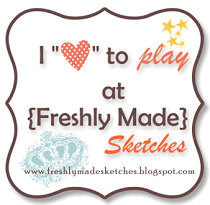 I have found that I use my Cricut all the time now that I have it out and easy to access. I got the ribbon shelf on the right from Crop Chocolate and the other white desk organizers at Michael’s (always at 40-50% off!). The brown/pink bag on the right of my desk I purchased at Hobby Lobby. This has all my essentials in it because I often scrap away from home or need to bring things upstairs (now with a little one) to scrapbook. I can just grab this basket and my project and I’m set. The “organize me” basket on my desk is also from Michael’s. It was too cute not to buy and it’s where I toss things when I don’t feel like putting them away and it keeps my desk clean. Of course, when it’s full I have to play clean up. These look mismatched because I found them piece by piece at rummage sales. They serve their purpose and fit in this space perfectly. Take note of the corner cabinet that I even use the space on top. These are the Close to My Heart Work-In-Progress Albums. I love 3-ring albums and these have a box to hold them and they stand up on their end very nicely! You can’t beat the $15.95 price either! Here’s a look at the inside of my cabinet. I think I got this at Shopko and although it is that cheap stuff it has worked great for me and even survived a move. I love that the shelves are 12×12 to fit my paper. I have had it for years and the shelves have held up the weight of all that paper! 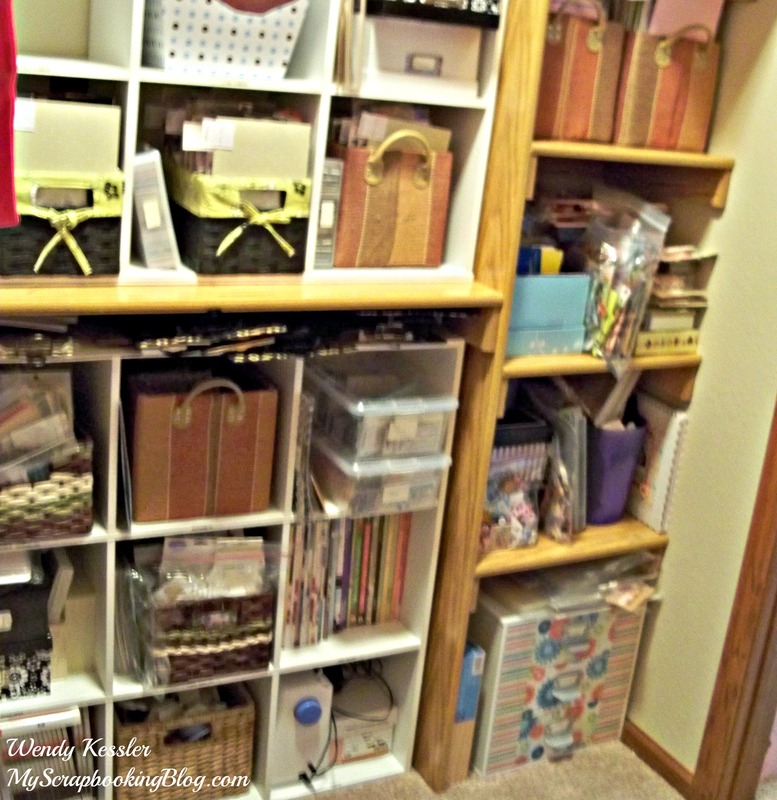 Everything in here is labeled and you can see more of my paper organization on this post. Here’s the newest addition to my room, some much needed 12×12 storage, bought at Michael’s on sale. I haven’t decided if I want to add a couple more to the left side. I originally started with a couple there at worked and they got moved to the closet. Now that they are gone I like having the extra space there but need to find a place for the boxes that are sitting on the floor. They store page kits as I make them up for each of the girls’ books. I’ve worked around the white board that came with the house and use it to keep track of my projects and deadlines. 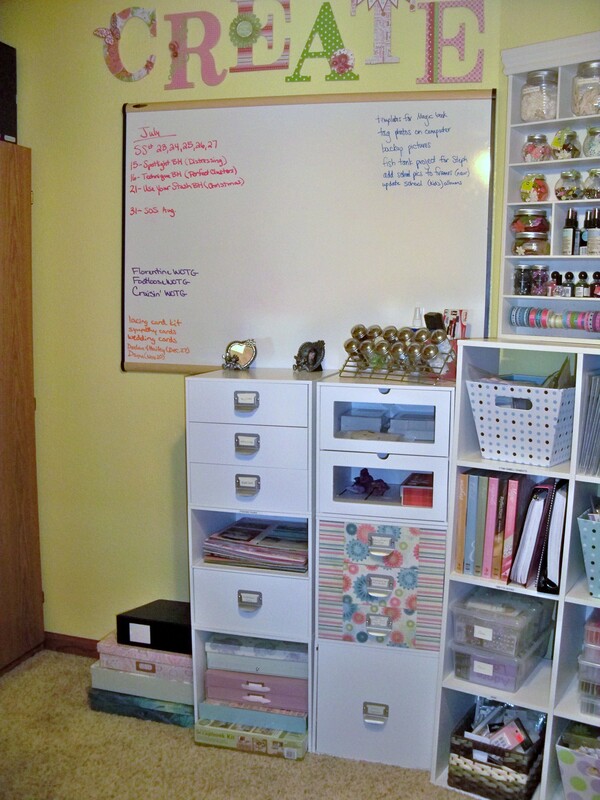 I have to also add that I got that white shelf on a rummage sale too for $10! You can see details for my CREATE letters on this post. And finally what started everything! I saw on Pinterest how Lisa had stacked her storage cubes like this and thought I’d give it a try in my room. You can get these at Target. It has given me so much more space! I have to also add that I got that white shelf at the upper left on a rummage sale too for $10! It’s meant to hang but it rests just fine when stacked like I have it. This is just some of my ribbons. 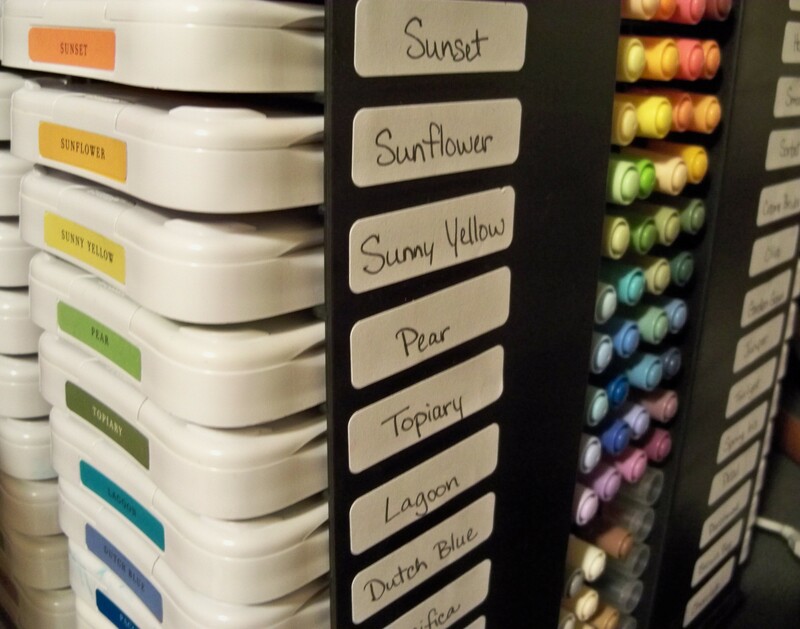 I like this as a storage option because it is so easy to find what I am looking for but I do have to use my ribbon iron. I have a lot of stickers/rubons/etc. that I store kind of by theme in baskets around my room. I took some heavier cardstock (with prints that I didn’t really care for), cut them and added tabs on the ends to stick out for labels like you see above. Some of my tabs are family, baby, birthday, holidays, butterflies, words, misc. I just thought about how I scrap and if I need a birthday-something, I just go to the marked basket and it’s all right there. I hope you enjoyed the tour. Now that I have everything neat and organized I feel like being in my room again and you should be seeing more projects posted again. I have some catching up to do! I think I paid $4 for this shelf. 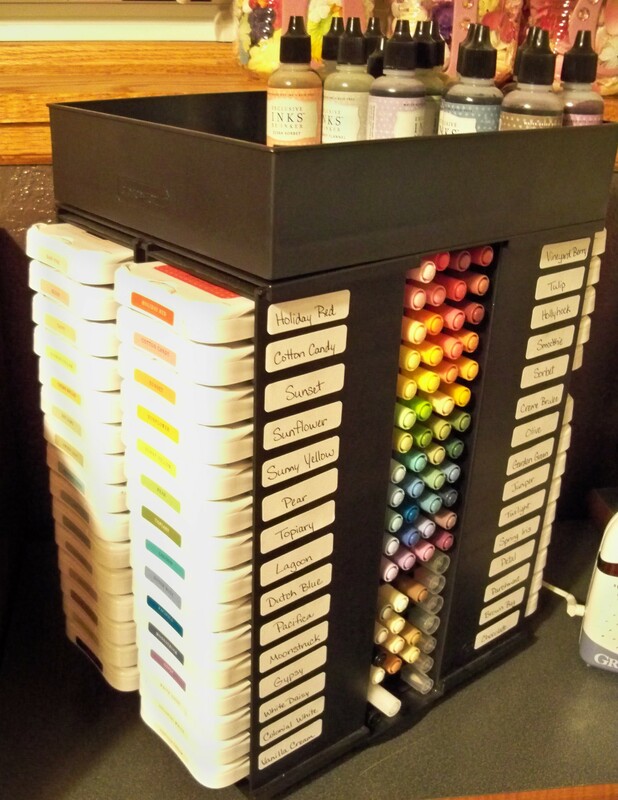 I wasn’t sure what I was going to do with it but I knew it would be great for organizing scrap supplies. Not sure the flowers will stay there but it works for now. I wasn’t sure where I was going to use this little set of drawers until it sat in my house for awhile. Originally, I had planned to use it for socks, shoes, and hairbands, etc. in my daughter’s room. Then I realized that the drawers hold the CTMH stamp sets perfectly! So it now has a home in my scrap room. I paid $10. 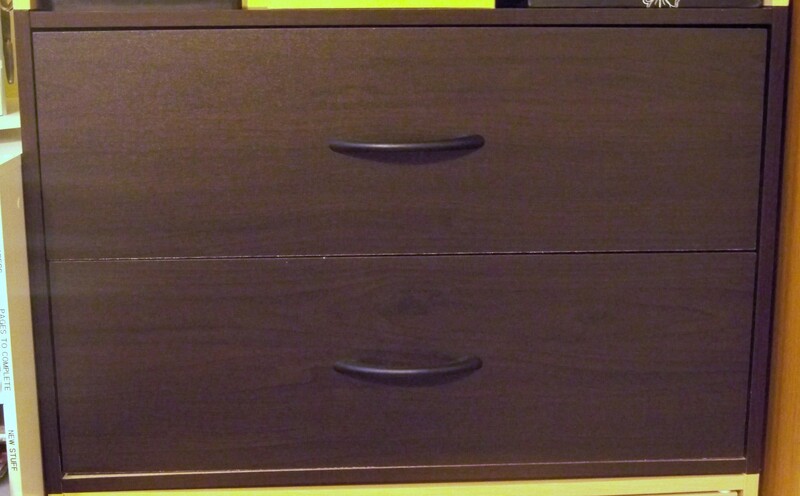 I only paid a couple dollars for this black set of drawers. It doesn’t match but I knew it would fit perfectly with my other storage. I suppose I could paint it but it’s fine for now and serves it’s purpose.